Glasshoughton Welfare suffered their third consecutive defeat when they went down 4-0 to Hull United at the KC Lightstream Stadium. It looked ominous for the under strength Welfare side when slack defending saw goals from Brett Agnew (two) and Josh Tennant put the strong Hull side three up after 25 minutes. But Welfare could have pulled goals back when the Hull keeper made a great save from Ashley Scothern and the same player poked another effort agonisingly wide. Welfare defended well in the second half, but Tennant got his second with a header. Glasshoughton were poor on Saturday when they slipped to a 3-1 home defeat against lower placed Winterton Rangers in Division One of the Toolstation NCE League. They were looking to pick up points against a side who had only won twice this season and at a cold Leeds Road the opening exchanges were scrappy, but recalled Welfare goalkeeper Matt Stables made a good low save low to his right to keep out Josh Batty’s shot. Welfare were lucky to go one up after five minutes when Tom Carr’s shot seemed to take a deflection as the bounce of the ball beat the visiting defenders and entered the net. Winterton were back in it on 12 minutes when poor defending from the hosts saw the ball crossed in and Garry Nimmo headed home. Welfare had a lucky escape a few minutes later when Stables completely missed his kick when trying to clear a back pass, but luckily the ball went wide. Luke Durham had a goal for Welfare chalked off for offside then Josh Morley somehow blocked a Winterton goal bound effort for a corner. The home team was also lucky when Tom Coyles seemed to bring down an attacker through on goal in the area, but the referee waved the visitors’ pleas away. They were not so lucky after 42 minutes when a deep cross was headed home by Craig Palmer. The second half was also a scrappy affair. Welfare defender Blaine Kellett cleared a ball off the line. The visiting keeper Adam Stevens tipped an Ashley Scothern header over the bar and the resulting corner saw Leon Cusworth head just over. 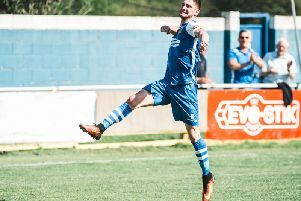 Winterton scored their third goal on 73 minutes when a shot from the ever dangerous Batty was parried by Stables and Palmer knocked the rebound home. A few minutes later Palmer should have scored his third goal when with only Stables to beat he headed a cross over. This Saturday Glasshoughton are away at Worsborough Bridge (kick-off 3pm) and they are also in action next Tuesday when hosting Pickering Town in the third round of the NCE League Cup (kick-off 7.45pm).